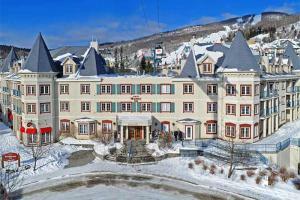 Situated in the heart of Tremblant Pedestrian Village, this hotel offers convenient access to premier shopping and dining, as well as acclaimed skiing and snowboarding at Mont-Tremblant Ski Resort. If you're visiting during summer, you'll be minutes away from Parc Plage, a lakeside beach perfect for family outings. After a fun-filled day, settle into an apartment-style suite with complimentary WiFi. Every morning enjoy a hearty buffet breakfast, included with your stay. During downtime, take a soothing dip in the heated outdoor pool and spa.